Chateau Bourgneuf Vayron is one of the oldest, family owned properties in the Pomerol appellation. The Vayron family has owned and managed the estate starting in 1821. Until 2012, the wines of Chateau Bourgneuf were sold and labeled differently, depending on the country. In some countries, the wine was sold as Chateau Bourgneuf. In other countries, the wine was marketed as Chateau Bourgneuf Vayron. That odd practice started in about 1970. That ended with the 2014 vintage, when the chateau officially changed its name to Chateau Bourgneuf. The 8.86 hectare vineyard of Chateau Bourgneuf is planted to 90% Merlot and 10% Cabernet Franc. 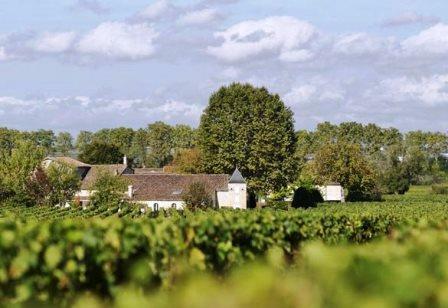 The vineyard is well situated on good terroir, right next to the vineyards of Chateau Trotanoy on the Pomerol plateau. Trotanoy is not their only famous neighbor! Chateau LEglise Clinet is located directly northeast of Chateau Bourgneuf as well. They also have vines next to La Cabanne. The terroir of Chateau Bourgneuf is made up of different soils. The vineyard has a section that is almost exclusively clay, which is their best terroir. They also have soils with sand, gravel and clay with some iron deposits as well. The goal of the Right Bank estate is to slowly add more Cabernet Franc vines, bringing the percentage of that grape variety up to 15% of the planted acreage. On average, the vines are an impressive 40 years of age. They also have old vines, with one parcel that is more than 70 years of age! The vineyard is planted to a vine density of 6,000 vines per hectare. To produce the wine of Chateau Bourgneuf, vinification takes place in traditional, temperature controlled, cement vats that range in size from 25 hectoliters up to 70 hectoliters. Malolactic fermentation takes place in vat. The wine is aged in an average of 35% new, French oak barrels for between 12 to 14 months, depending on the character and style of the vintage. The annual production ranges from 3,500 to 4,000 cases of Chateau Bourgneuf per vintage. Chateau Bourgneuf can be enjoyed on the young side with an hour or so decanting. This allows the wine to soften and open its perfume. Older vintages might need very little decanting, just enough to remove the sediment. The wine is usually better with 4-7 years of bottle age. Of course that can vary slightly, depending on the vintage character. In the best years, the wine will best between 5 and 15 years of age after the vintage. Chateau Bourgneuf is best served at 15.5 degrees Celsius, 60 degrees Fahrenheit. The cool, almost cellar temperature gives the wine more freshness and lift. Chateau Bourgneuf is best served with all types of classic meat dishes, veal, pork, beef, lamb, duck, game, roast chicken, roasted, braised and grilled dishes. Chateau Bourgneuf is also good with Asian dishes, hearty fish courses like tuna, mushrooms and pasta. Chateau Bourgneuf produces a rustic, lighter, traditional style of Pomerol wine that could be better, based on its terroir. Medium bodied, bright, forward and eager to show its spicy, earthy, red berry-filled slice of Pomerol, this wine should drink well close to its release. Medium bodied, sweet and tart, dark plums with bitter chocolate in the nose and on the palate, the wine finishes with plummy fruits and smooth textures. It was produced with 75% Merlot and 25% Cabernet Franc. Easy drinking, soft, medium bodied, plummy Pomerol that is focused on the red berry side of the style range. Light in color, with beefy tannins, the wine is medium bodied, dominated by raspberry and fresh cherry notes with hints of earth and spice. Medium bodied, with red fruits, leaf and earth aromas in the perfume, the wine is tart in the rustic, bright, plum finish. Austere, old school style of Pomerol is rough in texture and lacking in ripenes, fruit and charm. There is some red fruit, and hints of spice and earth, but the style of the wine did not thrill me.